Smo'dis hated the lightning. It was so loud and bright. He preferred the dimly-lit, slightly loud noise of the fort. Come to think of it, he didn't know where he was. Smo peered through the fog and was able to make out the form of a keep. "Hoowah, da ork keeb!" he shouted as he ran towards it. On the way, he heard a voice whispering, "Rel Xen Ylem, Rel Xen Ylem." Those were mojo words if Smo ever heard them, and he whirled around, clenching his hands to grip the lusk. . . that wasn't there! Smo panicked and looked at his hands. There was no weapon there! He looked into his pack. No weapon there either, but he found a strange book with mystical symbols on it. A mojo book! He dropped it back in the pack in fright and ran towards the keep in fright. "Rel Xen Ylem, Rel Xen Ylem." The fort was finally fully visible, and Smo could now see the forms of a full Shadowclan army, with Klapdud at the lead! He ran towards the army, shouting, "UG LATZ!!!" One of the orc kiggrz stepped towards him, looked at him, and lashed out with his kigg! In panic, Smo threw up his hands, and snatched the kigg clean out of his adversary's hands! He dropped it in his pack in a state of shock, and went back to talk to Klapdud, just as he got smacked in the head by a wompr. He toppled to the ground, dazed and confused. 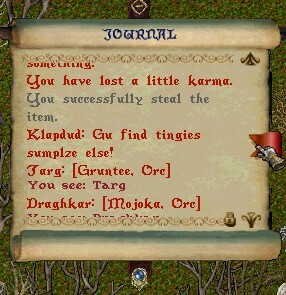 Klapdud walked over to him, picked him up by the scruff of his neck, and growled to him, "Gu find tingies sumplze else!" then threw him to the ground. Smo'dis ran long and hard. He didn't know which way he was running, only that he had to get away, that he needed to be alone. It was raining terribly hard, and Smo's robe was soaking wet. . . robe? Smo didn't wear a robe. And what was this thing on his head? It looked more like a dish than a helmet. Smo shook his head and ran on. Suddenly, a mojo hole appeared out of nowhere, and he couldn't stop himself. . . He was back at a keep. . . but this wasn't the orc keep. It was different. He pushed open the door and walked straight in. . . into a crowd of humies! He began to panic again, since he still didn't have a lusk. One of the humies, a female dressed in green, saw Smo's discomfort and asked him, "What's wrong, Asmo?" Asmo? Who was Asmo? It sounded an awful lot like Smo. . .
Another one, a strong-looking man covered in blood, looked at him and said, "Hiya Asmo." A third, a gentle-looking female, also greeted "Asmo" at the door. Smo'dis just nodded dumbly and walked into the keep. Smo'dis looked in the humie chests and found a well-polished shield. He picked it up and looked into it, then dropped it in horror! He slowly looked back into the shield, lying upright on the chests, and saw a humie, old and shriveled, staring back at him. His hair was gray from many seasons of adventure. Suddenly, the humie pointed at him! "Rel Xen Ylem, youth will be mine. Rel Xen Ylem, youth will be mine. I am Asmodeus, the most clever mage of all time! HAHAHAHAHAHAHA!!!!!" Smo tried to run but found he couldn't move! The humie continued pointing at him, chanting, "Rel Xen Ylem, Rel Xen Ylem." Slowly, the humie changed. . . his hair began to shrink until he had none left, his skin tone changed from pinkish to a dull gray. . . he was a mirror image of Smo'dis! Smo grabbed a lusk from the chest and screamed his war cry. Smo'dis awoke in a cold sweat. It was just the dream, just the dream again. But why did it haunt him night after night? What could it mean? He tried to think back to his past. No, nothing, still nothing. He couldn't remember his parents, nor how he came to be raised with his kuzin F'ru. He couldn't remember. . .
"O wel, id am nub impurtint," he said to nobody in particular as he slung his lusk over his shoulder and walked off for another day of clomping. Smo'dis awoke with a start. Angrily, he grabbed his lusk and slammed it into the nearest available outlet of stress, leaving a small hole in the fort wall. A nearby grunt chided him, and he mumbled, "Surri. . . " under his breath. Smo had lost track of the number of nights he had had this dream. He didn't care anymore. It was driving him mad, mad like the humies. He could almost feel the inner humie inside him, making him feel crazier by the minute. He needed to tell someone, anyone, before he went completely mad. Luckily, his cousin F'ru wandered into the fort, and Smo'dis quickly called him over to the ghaash to talk. F'ru came over and had a seat. Smo didn't know how to start, how to open the topic. Finally, he just blurted out, "Me hab tu blah tu lat abowd deez nubhosh dreemz me am habin." F'ru asked Smo to continue, and Smo told him everything about the dream: about being a mojo humie, about being attacked by the clan, and about the strange, friendly humies branded with a unique label. He explained how, at first, he thought it was just from eating too much humie stew before bed, but the dream kept coming back. "Su, kuzin," Smo asked, "lat tink me am reeli ash krazi humie?" F'ru knew his cousin, and knew that he was no humie, and he told him so. "Id am zimbul reeli. Da reezun lat keeb habin da dreems iz bekuz lat tink aboud dem ull muun, agh dat maykz da dreem stuk in latz hed. Id prubublee meens nuffin. . . juzd furgit aboud id kuzin." Smo looked at his younger, yet wiser, cousin and nodded. "Yub, lat am prububli rite. Me am juzd leddin id ged tu me, agh datz whi me keeb habin da dreemz. Rulg, kuzin. . . lat ulwayz gruk wud tu blah." Smo'dis felt great. He was actually whistling (or, at least, making a hideous orcish noise which resembled whistling) while chopping logs for the makrs. He smiled at other orcs, something he hadn't done in a long time. And when it was time for buutkamp, Smo'dis was one of the first in lineub, holding a freshly-shined lusk. Cali'hum brought the gruntees over to the guard tower for buutkamp, and as usual, the event was disrupted by humies from the start. Instrad of grumbling about "dum humies," Smo decided to take the opportunity to brush up on his archery. Many a humie was wounded by Smo'dis's deadly skills with the olig, weakened as they were. Life was good. Finally, the buutkamp was about to get underway! Apparently, something in Smo's mood cheered up the grunts, and he was picked to lead one of the teams in team clomp. He looked at the gruntees. Good solid orcs, every last one of them, straight down to the core. . . just like him. Smo'dis never knew why he turned to look in the direction of the death scream. It was just another humie falling to the might of the Shadowclan. But there was something about the humie. . . something almost. . . familiar. Smo'dis may be clumsy on the paws, but his vision is as sharp as a new igg, and he peered over the wall to see what had died. F'ru noticed, just a split second before Smo'dis, and blurted out the horrible name of the symbol which was all too familiar to Smo from his dreams; "SnR!" Smo just stared in a state of shock. Dreams and memories merged into one. The pounding of his heart turned into a chant when passing through Smo's ears. "Rel Xen Ylem, Rel Xen Ylem, HAHAHAHAHA!!!" Smo'dis stopped breathing. He stopped moving. His heart stopped beating. And time stood still as all he could see was the mark of the fallen humie. Finally, he was awakened from his trance by Cali'hum shouting, "SMO PIK FURST!" Smo'dis was not haunted by bad dreams about humies that night. Though that's probably because he spent the entire night curled up in a ball, shaking violently, staring wild-eyed into the darkness. It was the first time in his orcish life that Smo'dis didn't feel like clomping. He had lost track of how many days it was since he left the fort. He didn't tell anyone where he was going, not even his cousin F'ru. What would he say if he did? I'm leaving, I don't belong, see ya? Smo didn't like the sound of that. He hated goodbyes. It was raining heavily that night. Smo couldn't tell if it was rainwater or tears dripping down his face, when he took a last look at the empty fort. 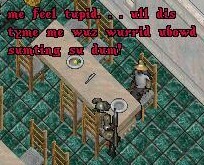 "Ib me am reeli humie, den me am fork, agh me nub belung heer," he whispered to himself. "G-gug'ye, latz. . . "
But that was all in the past now. Smo did what he had to to survive. He had no company, save for the occasional monster, and they didn't stay long. . . not in one piece, anyway. Smo'dis now knew what it felt like to be a fork, to be an outcast from the fort. It felt pretty miserable. Of course, nobody actually told him that he was a fork or an outcast. But he knew that if he was a humie, then he was a fork. No ifs, ands, or buts. Smo wondered why the grunts couldn't see it his way. He still had the dreams regularly, but they didn't bother him anymore. At least, no more than he was bothered during his waking moments with the knowledge that it was more than a dream. Smo didn't know what to do next. He couldn't go back to the fort, that was for sure. He couldn't go to the humies because he was an orc. . . he wasn't an orc. He wasn't an orc, even though he felt like an orc. He was a humie. After so long, he finally began to figure out that if he was a humie, he should go back to his own kind and learn how to act like one. He had to seek out the keep from his dreams. He had to find his home. But was home forward at the keep, or back at the fort? No matter what he thought, Smo couldn't help but feel like an orc. It was all he knew, it was all anyone knew. How could he not be an orc? He clomped humies, he led shardies, he helped out other runtees, he obeyed the grunts. Why did he have to have these dreams? Why did he have to be a humie? He wasn't a humie, that was for sure. But he wasn't an orc either. So. . . what was he? He knew there was only one place where he would find the answers. The almost-abandoned stone keep with the label: SnR. Smo'dis drifted in a state of semi-consciousness. He was still dreaming, that was for sure; but he knew that this dream was very real. He smiled inwardly, knowing that this time, he would take advantage of his dream to find the way to his destination; the mysterious keep that haunted his dreams. He was there, at the keep. He quickly assessed his surroundings. Mountains on either side, and a small cave. He looked at one of the humies, and spoke to them. Strangely enough, his words came out in perfect humie. "Where are we?" he asked. "We're at the keep, of course, Asmo. What's wrong?" "No, no, I mean what are we near?" Smo'dis figured that he could find the way to the keep by learning of landmarks. And learn he did. The humies told him what was nearby. Smo thought to himself. "Yub, me kan fynd dis plaze nuw." Smo'dis awoke and rubbed his eyes. It was time to move out. He checked his supplies and found that he was in need of some things. Luckily, he had plenty of gold saved up to buy some. He set off west in search of Wispwood. Upon reaching Wispwood, Smo ran into a humie. Under normal circumstances, he would've demanded tribute or prepared to clomp him. But he wasn't sure if he himself was a humie, how could he clomp another? So he said ug and took off with his new stock. On the way back, a harpy decided to follow him. So Smo'dis decided to lure it back to his hidden stash of things to clomp it, then add its things to his pile. However, on the way, Smo became distracted by the harpy's incessant squawking. He turned towards it, then decided against clomping it until he reached his secret bag. He turned back around. . . and almost walked smack into Gerak! Smo was stunned. What was a grunt doing so far from the fort? What was he going to say? He couldn't go back to the fort, but he couldn't disobey a grunt, even if he was a humie. He walked around a bit, hoping for the first time in his orcish life that the grunt would just go away. Well, Gerak did go on his way. But he was followed by a naked runtee. Smo said ug and took the runtee in with him to his supply bag, where he outfitted him with his extra set of armor and some rags. Together they clomped the harpy. The runtee asked if Smo would go back to the fort with him, but Smo couldn't go. . .
Smo'dis continued his journey towards the mysterious keep. He could feel that he was getting closer. It was almost an instinct. Pretty soon he came across a small house that seemed very familiar to him. It almost felt like. . . home. . . There was no time to stop now. That small house bore the SnR insignia; therefore, he was probably very close. He headed south, into the mountain pass. 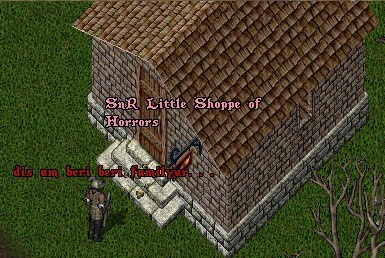 He passed a few large houses, but finally found what he was looking for: the SnR keep! Now Smo'dis knew better than to charge savagely into the keep. Instead, he decided to look for things outside that would help him understand better. He noticed a book on the steps and couldn't resist taking a peek inside. Smo flipped through the first few pages. Nothing special. Some scribbles from an unknown humie, one from the humie that was clomped back at Cali's buutkamp, even one from Zortee who had apparently found his way here and decided to say ug. But it was the scribble on page 6 that caught his eye. A bit disgruntled, Smo set up camp, hid himself under some brush and went to sleep, waiting for a humie to drop by. Smo'dis crouched in the brush as the humie rode up to the keep, put key to lock, and entered. This humie looked familiar somehow; wise and knowledgeable, and Smo knew instinctively that this humie would have the answers he was searching for, that she was the key to his past. He tiptoed into the keep, following the humie. Apparently, it wasn't as easy for Smo'dis to go around undetected as he thought. This "Bella Noir" humie decided to introduce Smo'dis to a "bath," and tried several times to conjure up some mojo by chanting the words "Kal Vas Xen An Flam" repeatedly. Luckily, the mojo seemed to be afraid of Smo, and nothing happened, much to his relief. Smo asked the humie if she knew who he was, and she told him that he looked as familiar as someone could look with their face covered. So Smo'dis took off his helm. Bella ran her fingers over his face trying to identify it. "Gah, mi mouf!" Smo remarked. Bella told him that he did, in fact, remind her of a humie she knew once. His name? Asmodeus! The name from the dream! The name that sounded so much like his. Was it - was it true then? It had to be true. . .
Then Bella said something which made Smo feel a bit better. Smo'dis was relieved that he wasn't a humie. . . but Bella said that he wasn't orcish, either. In fact, she didn't know what he was. Smo decided to turn this line of questioning back to the humie. He asked questions about the mojo man, and every one of Bella's answers confirmed what he already knew. . . including this one! In the space of a second, Smo'dis had a flashback to his recurring dream. "Rel Xen Ylem, youth will be mine." That was what the mojo humie kept saying, and that was what Bella confirmed! Bella said it was very possible, and if he was that humie, then he should recognize her. . . he looked carefully at her. He did recognize her as the woman from the dream! Smo quickly told her of the dream about the man in the blue robe. Bella asked Smo to wait a second, then went upstairs. She returned holding something. . . it was the robe! Smo was in shock and couldn't remember anything else from that night. All he knew when he woke up in the woods was that he was outcast from both worlds. . .
Smo picked up his lusk and set off, in no particular direction whatsoever. Smo'dis wandered Britannia in a daze. He had nowhere to go, nothing to do. For once, he was free from everyone else. And he was lonely. Being a hermit didn't have many ups, but did it ever have downs. He wandered along the road and ran into a humie with an AoD insignia. Smo'dis didn't even notice, didn't even care. The humie attacked and Smo just stood there, defending himself. By the time he missed his second swing, it was too late, and Smo found himself traveling to the Wargod while silently muttering about the slowness of lusks these days. The Wargod seemed to know that Smo'dis wouldn't be his usual mouthy self when he arrived. His voice boomed out, "SMO'DIS!" Smo glanced up, decked out in a full set of ring armor and a very large lusk, and said, "Yub?" "WUD AM LAT DUIN BAK HEER? LAT AM HEER TUU MUCH! LAT AM KLUMZEE!" "Yub, sur. . . " Smo mumbled. "LAT NEEB TU LURN KUNTRUL! LAT GRUK ME?" 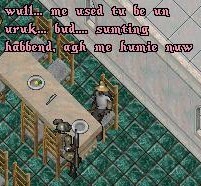 Smo only said, "Kan me gu bak nuw?" The Wargod's answer surprised him. "NUB KAN GU BAK NUW!!!" "W-wud? Bud. . . bud. . . "
"IZ DER ASH PROBLUM WID DAT, SMO???" Smo'dis wasn't one to argue with the Wargod. "ME GRUK DAT LAT BEN BODDURD BI WEDDUR UR NUB LAT AM REELI ASH ORK, RITE?" "Yub, dat rite. . . bud huw lat gruk dat?" "YUB. ME GRUKD DAT BEKUZ ME AM DA MITEE WARGOD! DER AM SUMASH ME WAN LAT TU MEET BEFUR LAT GU BAK!" "YUB! ME TINK IM KAN HELB LAT." Smo'dis was open to any suggestion on how to deal with this problem. He saluted and said, "Yub sur!" Smo soon found himself in a strange place, with many buildings made of marble. Under the Wargod's command, he was not to clomp any of the humie slaves, even though he probably didn't need it; Smo wasn't sure if some of them were family. The place was beautiful, something that surpassed Smo's wildest dreams. He felt safe, comfortable. He followed the Wargod's command and entered a building. The floor was a soothing shade of turquoise. A humie sitting at a table beckoned Smo over to him. Curious, he went to sit down. The humie introduced himself as "Aragorn." 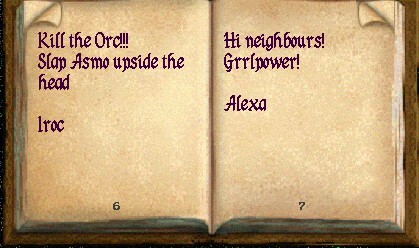 To Smo's surprise, Aragorn spoke orcish! 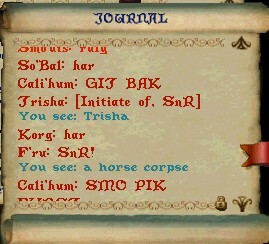 Smo inquired about this and Aragorn gave this answer. Smo'dis knew at that moment that this was the humie the Wargod wanted him to meet. Their stories were so similar. . .
"Dat sownd lyk mi sturi," Smo said, "bud me wuz humie, agh nuw me am ork. . . nuw me nub fid in aniwhare." "NUB!" Aragorn protested. "Me wuz uruk, bud me am humie nuw. Idz nub dat bad. . . me kind ub lyk id." "WUD???" Smo replied. "Lat LYK bein humie???" Aragorn told him, "Ib lat am uruk nuw, BE uruk. . . agh be PROWD ub id!" "Bud. . . bud me nub am ork, me am humie. . . bud me am nub humie eedur. Nub ork, nub humie, me am nub ANITING!" But Aragorn wouldn't hear of it. "Bud me wuz nub burn az ork!" Smo protested. "Su wut? Me wuz nub burn az humie." Aragorn replied. "Lat luuk lyk humie tu me." "Bud lat wuz burn az ork!" Aragorn sighed. "Ukee, luuk. Lat ebur hurd ub da buddurfly?" "Yub!" Smo replied. "Dem am liddul agh fli urownd." Aragorn smiled. "Dem wuz caddurpillurz ad ash tyme. . . bud dem chanjed!" "Su dem am caddurpillurz? Bud dem am buddurfliz!" Aragorn sighed; this was not easy. "Dem WUZ caddurpillurz, bud nuw dem am buddurfliz! Agh ib dem kan chanj, aniash kan chanj. Id am blahd 'medamurfusis'." Smo was puzzled. "Wud lat meen?" he asked. 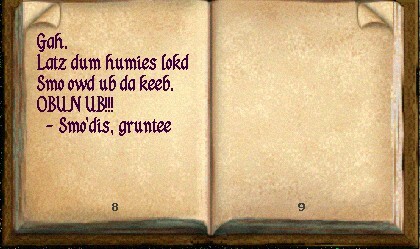 "Id nub maddurs wut lat wus," Aragorn explained, "unlee whu lat am nuw." "Agh dat am uruk fur shur!" Aragorn finished. Smo'dis thought about this for a minute. "Yub. . . dat mayks senze. 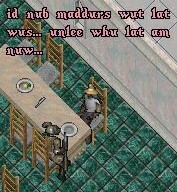 . . su id am huu me am nuw agh nub huu me wuz dat reeli maddurz?" "Yub, huu lat am nuw." Smo'dis felt relieved. He knew now what he really was. He may have been a humie before, but now, he was an orc! A true-blue, 100% orc! "Su DAT am whi da Wargod wuntud me tu blah tu lat! Ull dis tyme me wuz wurrid ubowd bein humie. . . bud me am ork nuw!" 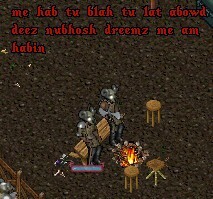 "Rulg, Aragorn, lat helbd me bubhosh. . . me uwe lat ash!" Smo said with a big orcish grin on his face. "Har, idz ukee," Aragorn replied. Just then, the Wargod yelled to Smo, "EY LAT! GED BAK HEER!" Smo headed off, then turned back to Aragorn. "Uki, me hab tu gu. . . bud rulg agin! Gug'ye!" Aragorn waved as Smo raced off, in high spirits and excited to get back to the Wargod. 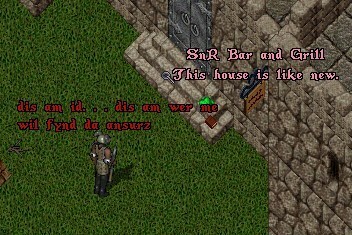 "UKI, LAT REDDI TU GU BAK?" 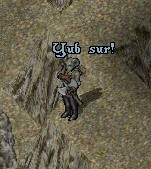 "Yub sur!" Smo shouted happily. "Juzd ash, sur," Smo'dis replied. "Kan me keeb deez tingiez?" "NUB! DAT AM MI BEZD SUUT UB ARMUR AGH MI BEZD LUSK! ME AM TAKEEIN DEM BAK!" "Bud wud kynd ub udvenchurin ork guz bak tu da furt nekid agh wifowd ash wepin?" "DAT AM UB TU LAT!" Smo'dis smiled. "Su lat am gibin me ash Shaduwkwest!" "NUB!!!" the Wargod shouted. "NUB BE DUMHED! DAT AM NUB MI JUB. LAT NEEB SPONZURZ IB LAT WAN TU GU ON ASH SHADUWKWEST! AGH LAT NUB HAB ANI BEKUZ LAT AM LAYZEE, SLEEBI, AGH KLUMZEE!" "Yub, sur. . . " Smo'dis muttered. 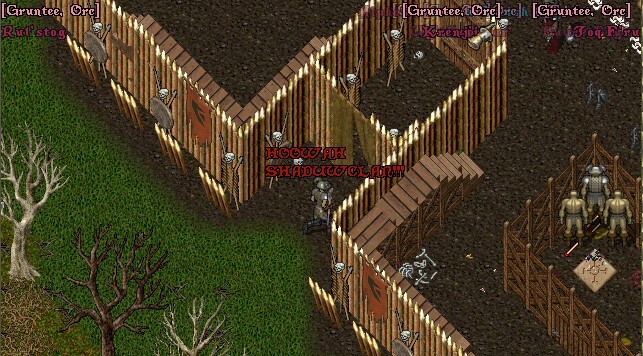 The Wargod sure had a way to depress even the happiest orcs. "BUD, IB LAT WAN, TINK UB DIS AZ PRAKTIS SHADUWKWEST!" "Praktis, yub! Den me wil be reddi fur da reel ash aftur me ged sponzurz!" Smo replied. "NUW GED GUIN! ME NUB WAN TU SEE LAT AZ MUCH ANIMUUR! GU AGH CLOMP!" "YUB SUR!" Smo'dis yelled as he was transported back into the realm of the living. He was an orc; it was time he proved that, if to nobody else but himself. Smo'dis shuffled through what was left of his belongings. Not much. . . his helm and boots, a couple of bedrolls, a pair of cutters, and a bunch of assorted useless stuff. He bagged it and headed off to re-equip. The basic survival skills Smo learned as a cubbie came in useful. He wrestled mongbats and sewer rats for shinies, and he stole bandages from healers and gold from other monsters. When he had 27 gp saved up, he headed to Wispwood where he bought a hatchet. He used the hatchet to chop some trees and clomp some birds, and soon had a bow and 50 arrows. He headed into Rat Valley to clomp a shardie captain. Since this wasn't an actual Shadowquest, Smo didn't want to put too much time into it. He figured that a tunic and decent lusk would be enough. All he'd need for that was a shardie captain. He collected the wool off of a passing sheep, and clomped several headless, but couldn't find a captain. 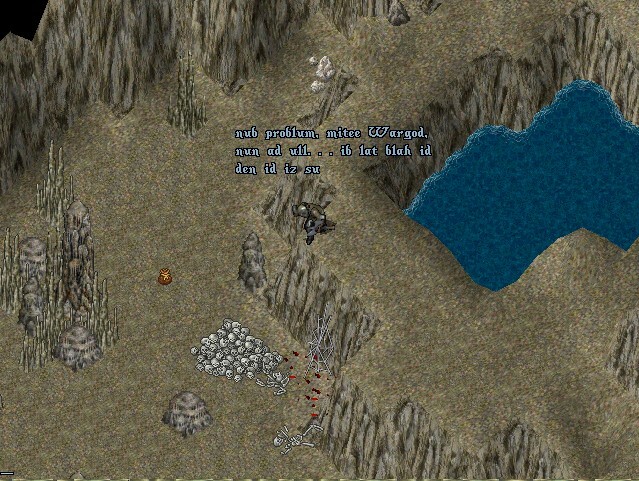 Finally, he spied an orc camp! Taking his bow, he took out an orc guarding the captain, and noticed that he had been holding leather gloves. Well, they were Smo's now. He then clomped the captain himself. Not only did he have a ringmail tunic, but he had a studded tunic as well! It was Smo's lucky day. He equipped the faster tunic and headed off for the fort. His trip was cut short by another AoD, but this time, Smo wouldn't be a weak half-humie. In his current weakened state, he figured that he who fights and runs away lives to fight another day. In this case, though, he hid. Five of six shardies soon arrived to distract the AoD, but just to be safe, Smo set up camp and hid under some brush. The next morning, Smo awoke. The sun was shining and the birds were singing. It was a great day to be alive, especially if you were an orc. And Smo certainly felt like an orc! He raced to the fort. The trip back was rather uneventful, so Smo switched tunics, choosing style over practicality, and raced to the fort, shouting "HOOWAH SHADUWCLAN!!!" Things had changed since Smo was there last. His cousin F'ru was a grunt, and X'ugar was back from the dead and in full command. Nobody realized right away that Smo was gone, and the only ones to welcome him back were Bramos and Gul'Thuk. But it didn't matter to Smo. He was among his own kind. . . and he was home.